Woke with coffee being delivered to our sleeper at 6.30 a.m. We were at Carstairs Junction and we were able to continue to doze until the train arrived in Edinburgh at 7.20. Leaving the train, we had a few minutes to wait until our train back to Berwick just after eight. Collecting the car, I drove Rachel to her stained-glass class and hurried back to Mount Pleasant to see how Mix and Rowan had got on, or rather, how Olive, Digger and Mum had survived. All was well! Yesterday Mum had been to her reading group, taken by Ann, and last night she was at the Presbyterial Rally at Eyemouth. The dogs had behaved and everyone was happy. Tom and David were waiting for me with the news that the concrete lorry wouldn’t be coming until the early afternoon. So we had coffee (when in doubt have coffee) and opened up Ianthe, taking off the electrical equipment I had bought for her so that David could cast his eye over it. 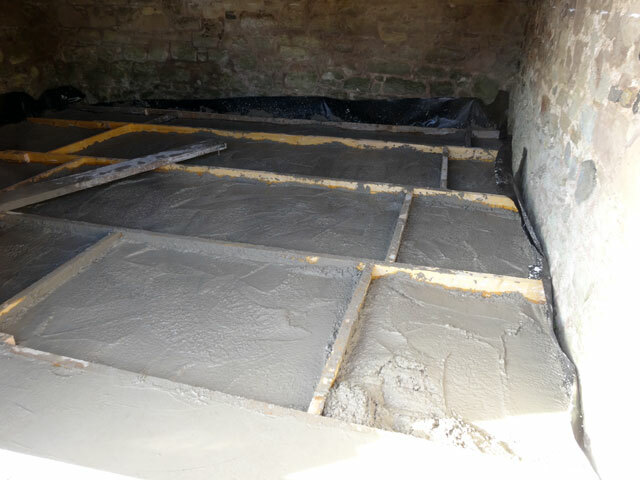 We dined at Pearsons and then the concrete lorry arrived and we spent a hectic hour and a half, with help from Digger, spreading concrete over the plastic sheeting to create a firm base to the Bothy. Now we have to wait until it dries so we had some coffee and then all went about our business. Rachel returned from her glass class with a bandaged finger – she had grabbed her soldering iron at the wrong end. Mum returned from a day in Galashiels with a friend and soon it was time for us all to eat – Tom and David arrived (Tom to check on the concrete, David having forgotten something) and Rachel set off for her choir with Bridget. I was glad to take things easy as I will have another early start tomorrow. But what a good day it has been.